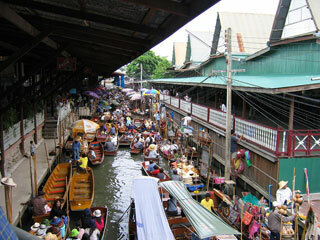 Floating Markets are on the canal, produce such as fruits, and vegetables, as well as fish are sold from boats. There is a live traditional Thai music performances. This is a new attraction since floating markets, an old way of life of the Thai people, had vanished entirely from Bangkok for quite a long time. This article uses material from the Wikipedia article "Bangkok Floating Markets", which is released under the Creative Commons Attribution-Share-Alike 3.0 License.